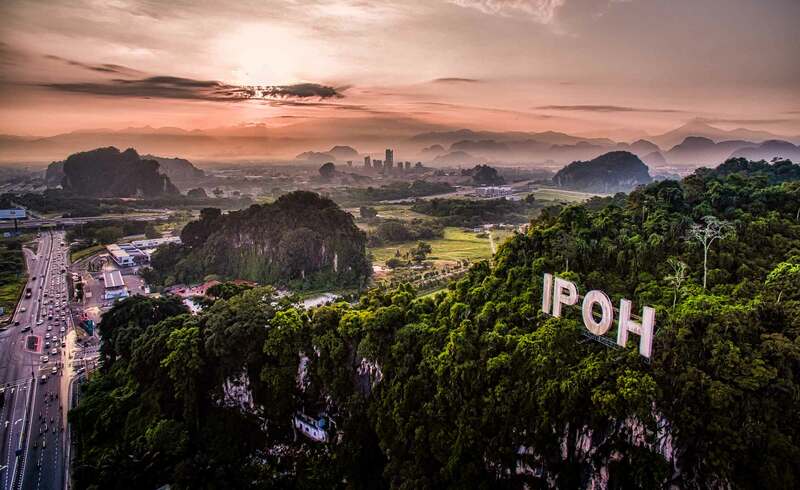 Ipoh is the capital city of the state of Perak and is one of the biggest cities in Malaysia with over 750.000 inhabitants. 70% of Ipoh's population is of Chinese origin. The city is located at a distance of approximately 200 kilometers to the north of Kuala Lumpur. From the North-South Expressway you can reach Ipoh within 2 hours by car. From Ipoh you can reach the island of Penang in 1,5 hours (150km). The city used to be the center of the tin industry (in the world); but those days are long gone. Nowadays the city still recovers from the important role it used to play; but it has much to offer to tourists. Ipoh is surrounded by beautiful limestone outcrops with wonderful cave temples; some of Malaysia's biggest attractions are only a couple of hours away by car. Today's Ipoh is well known for its excellent restaurants, hawkers, and famous local dishes. Because of this you will find famous 'Ipoh cuisine' hawkers at many places throughout Malaysia. Ipoh has many nice attractions and sights in and around the city. One popular attraction is the Gunung Lang recreation park; where many locals spend their time to relax as it is just few kilometers away from the city center. The Lost World of Tambun Park is also a very popular attraction among locals and tourists. The city also houses beautiful architecture, such as the Railway Station, Town Hall and High Court. Other attractions are: Kinta River, Mariamman kovil temple, Ipoh Heritage Walk, Kellie's Castle, Perak Cave with its numerous beautiful Buddha statues, Sam Poh Tong temple and the Kek Lok Tong temple. There are also numerous night markets at different locations throughout Ipoh; besides browsing for nice buys you can also buy snacks and food at the markets. Nearby Ipoh there are many amazing attractions. One of the most popular attractions in Malaysia is the Cameron Highlands. Here you can enjoy the cool climate. The area is especially popular among nature lovers and hikers. Another great attraction is Pangkor Island; this beautiful island lies to the southwest of Ipoh (1 hour drive from the city). Also gaining popularity is the Royal Belum Nature Park. Belum Nature Park offers a host of activities like fishing, kayaking, jungle walking, bird watching and camping. Best way to get to Belum is by rental car . A taxi is also an option; but an expensive one (over RM150 one-way). For a city with over 750.000 residents you would expect numerous huge shopping malls. However; this is not the case in Ipoh. There are of course some nice malls, but not as much as you would think. De Garden Complex is one of the most popular malls in Ipoh; it has many international brands and other popular shops and restaurants. Other popular malls in Ipoh are Kinta City Shopping Centre and Ipoh Parade; both offer enough shops, restaurants, amusement centers and cinemas for a fun day out. We know people that travel from Ipoh to Kuala Lumpur for some serious shopping; and we often hear people from Ipoh complain that their city has a major shortage of good shopping malls. he cheapest way to reach Ipoh is by coach. There are quite some bus operators that have daily busses driving between Ipoh and many other locations within Peninsular Malaysia. From the main bus terminal Puduraya in Kuala Lumpur many busses a day leave towards Ipoh. The trip from Kuala Lumpur to Ipoh by bus will take about 2,5 hours. Busses arrive in Ipoh at the Medan Gopeng Ipoh Bus Station. Larger bus companies like Transnational, Plusliner, Konsortium and Sri Maju provide the most frequent, reliable and relatively safe services. Tickets from Kuala Lumpur to Ipoh only cost a couple of ringgits. You can easily travel by train between Kuala Lumpur and Ipoh as there are daily trains that depart from KL Sentral. The train takes about 3 hours to reach Ipoh. From Ipoh the train continues to Butterworth (nearby Penang Island) en from there continues all the way to Bangkok in Thailand. Alternatively the slightly more expensive ETS trains provide eight return trips for the Kuala Lumpur-Ipoh route daily. The ETS reduces travel time between Ipoh and Kuala Lumpur to about two hours from three hours previously. Another way to get to Ipoh is by rental car . It is easy to rent a car in Malaysia. Numerous car rental companies have special pick up or drop off locations throughout the country; some might have such location in Ipoh. Hawk Malaysia does not have a drop off point at Ipoh, but they do have two in Penang. You can easily pick up the car at an Hawk office in Kuala Lumpur (KLIA or city center) and then drive with it to Penang via Ipoh. From Kuala Lumpur it is only a 2 hour drive to Ipoh. Many tourists combine their trip to Penang/Ipoh with a visit to Cameron Highlands or a visit the Pangkor Island; both relatively nearby Ipoh. Flying is not an option when you need to travel from Kuala Lumpur (or other places within Malaysia) to Ipoh. When you travel to Ipoh it is best to first travel by air to either Kuala Lumpur or Penang (International Airport) and take a taxi or bus from there (in case of KL you can also take the train). From Singapore it is easy to reach Ipoh by air as there are daily flights from Changi Airport Budget Terminal to Ipoh's Sultan Azlan Shah Airport. Cameron Highlands is a very popular attraction nearby Ipoh. You can easily travel to Cameron Highlands by rental car , bus or even taxi from Kuala Lumpur or Penang (and also from Kota Bharu and Taman Negara via the new highways). From Ipoh it is only an hours' drive to Cameron Highlands. There is a toll-free road to Cameron Highlands close to the Simpang Pulai Exit off the North South Expressway. There are daily busses that depart from Ipoh's Medan Kidd Bus Station and Medan Gopeng Bus Station to Tanah Rata Bus Station in Cameron Highlands. The journey by bus roughly takes 3.5 hours and will cost only a couple of ringgits. Easiest but also the most expensive solution is by taking a taxi from Ipoh (city center or airport) to Cameron Highlands. This way you will reach Cameron Highlands within 2 hours, but this trip will cost over RM100. Popular hawker centers in Ipoh are: Tung Ku Teng Food Court (Emas Food Center), Xian Er Nong Hawker Center, Woolley Food City, Ipoh Stadium's Food Court, Vegas Food Court, Odeon Food Court and Kinta City Food Court.